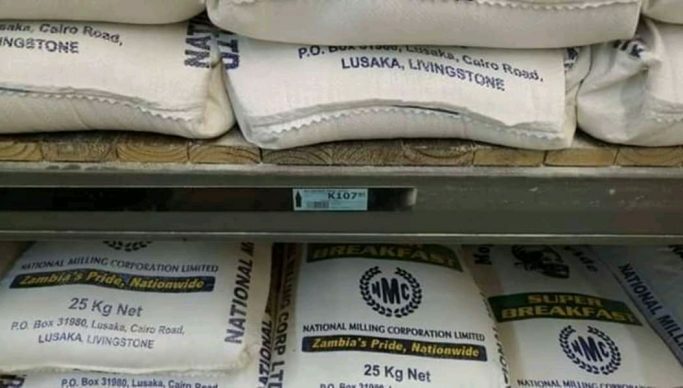 MEALIE Meal prices in some parts of Lusaka have been hiked to as much as K110 for 25kgs of breakfast from K85, representing up to 27% increment. Jesuit Centre for Theological Reflection (JCTR) this week urged the government to closely monitor and regulate the amount of mealie meal being exported to avoid shortages and price hikes of the commodity in the long term. A survey by NewsdayZambia.com in Libala South on Kasama road found that while breakfast mealie is selling for as much as K110, roller meal ranges between K90 and K100 in some outlets. A further check at Chelstone small market revealed that a 25 kg bag of breakfast is selling at K 90 and roller meal at K87. A resident spoken to only identified as Marjory complained that the price is too high. She said that a 25Kg bag of breakfast mealie meal in some shops is selling between K95 and K90 while roller meal is selling between K85and K95. Marjory has however appealed to government to quickly assess the situation and put up measures to prevent the prices from rising further. And in Mongu district a 25 kg of breakfast is selling at K105 and roller meal pegged at K100. Mike Sitali told newsdayZambia.com in a phone interview that it is challenging to note the cost of staple food was so high. He explained that a lot of people do not have income while the cost of living was rising. “Commodity prices are still escalating, we do not know how people will survive,” he said. Sitali lamented that rising mealie meal prices was worrying and should not be ignored. “The yields were poor in the last farming season,” he said. Sitali also observed that the financial outlook for the country was bad. “Even those with a good income have a lot of taxes to pay and take-home money is too little to take care of their families,” he said. Meanwhile, in Kaoma district a 25kg of breakfast supplied by National Milling Company is selling at K93. Kaoma District commissioner Kennedy Mubanga disclosed that for some brands a 25kg of breakfast and roller meal is selling at K110 and K100 respectively. He said that the district has no shortage of the commodity as suppliers were consistent with supplies. Mubanga explained that residents had no choice but to purchase the commodity despite the hike. And residents of Shiwang`andu district in Muchinga Province have complained over the hiked prices of mealie -meal due to shortage of the commodity in the district. The residents talked to by the Zambia News and Information Services lamented that they had been affected by the sudden change in mealie meal prices in the district, a thing they said should be addressed. Director for Mansya River Enterprise Limited, Charles Harvey said that Shiwa Milling, a jointly owned by his company and Musika had been working tirelessly to ensure that the local people buy mealie meal at a relatively cheaper price. Harvey stressed that lately the milling company had been having challenges to access maize from local farmers resulting in the shortage of Shiwa mealie meal on the market. Harvey however, expressed optimism the company would this week procure 2000 x 50kg bags of maize from the traders for the production of mealie meal. In a statement on Monday, JCTR warned that while the lifting of the mealie meal ban might contribute positively to Zambia’s Gross Domestic Product (GDP) and the Balance of Payments through increased foreign earnings from export revenues and contribute to maize farmers’ profitability and increase their incentives to produce maize, the decision may impact negatively on the poorest of the poor who solely rely on maize meal.